As with View of Notre Dame (CTB.1998.61), here Gustave Loiseau chose to paint an area of Paris he had been familiar with for a long time. In 1887, when he had decided to devote himself to painting, Gustave Loiseau had settled in Montmartre, in rue de Ravignan. Rue Clignancourt is only a few steps away, at the foot of the hill it borders to the east. To describe it, the artist placed himself in the corner of the street and of boulevard de Rochechouart, where a brasserie now stands. The area, which is always very busy due to the nearby Tati stores, has changed very little. At the crossroads visible in the foreground, the cars have become more numerous than the strollers, and on the right a newspaper kiosk has replaced the old roundabout. But here again we can appreciate the precision with which the artist observed and recorded the topography of the area. We can easily recognise every detail transcribed on the canvas: the slightly chaotic succession of building façades of different periods and styles, as well as the chimneys and skylights that punctuate the buildings, are immediately identifiable. Flags liven up the scene and dot it with the colours blue, white and red. 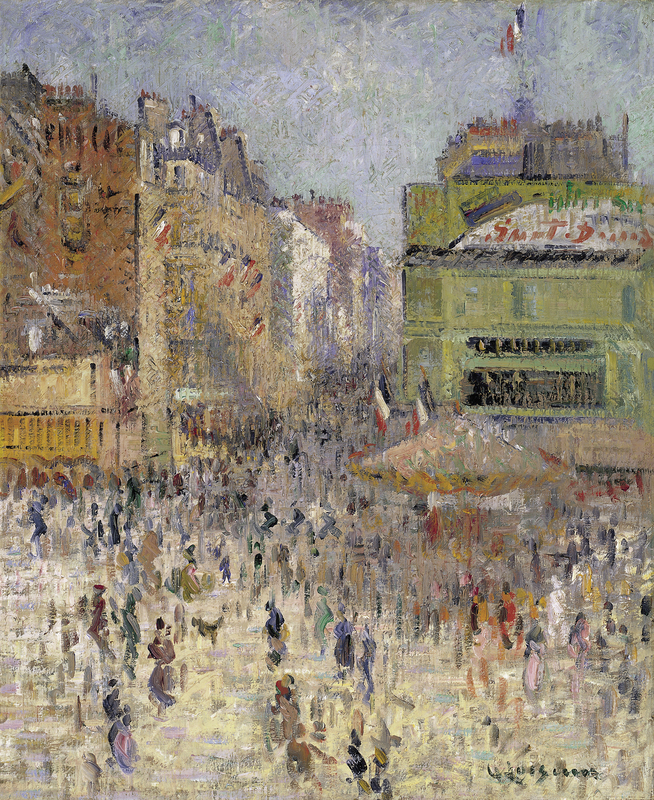 The crowd has invaded the boulevard, and the bright and clear light is that of a summer day in Paris. Loiseau conveys well the atmosphere of 14 July, a national holiday in France. On the blind side wall of a building situated on the right-hand side of the street and now called-rather surprisingly-"Grand Hôtel de Clignancourt, " were advertisements, which the artist transcribed and which vary according to the version. In fact, Gustave Loiseau showed a particular predilection for the view of the rue de Clignancourt, which he painted many times around 1925. Always from the same point, the artist represented this urban scene in good and bad weather, with or without flags and in different periods, as indicated by the painted advertisements which vary from one version to the next. He also took up the subject of 14 July the following year, in 1926, in a painting kept at the Dieppe museum. In another version (private collection) the trams and horse-drawn carriages take up as much space as the pedestrians. Finally, another one, The 14th July in Paris (rue de Clignancourt), painted towards 1925, and very similar to the one analysed here, was once in Alain Delon's collection. "I only acknowledge having one quality, that of being sincere. I work in my own little corner, as well as I can, and do my best to convey the impression I receive from nature[...] Only my instinct guides me, and I am proud I do not resemble anyone, "1 declared the artist. Nevertheless, his views of Paris clearly recall the streets decorated with flags painted by Monet, such as Rue Montorgueil, Paris, Festival of June 30, 1878 (Paris, Musée d'Orsay) painted in 1878, as well as the series of views of Paris painted by Pissarro from a window, like those of the boulevard des Italiens and the boulevard Montmartre in 1897, or of the avenue de l'Opéra and of the place du Théâtre Français the following year. 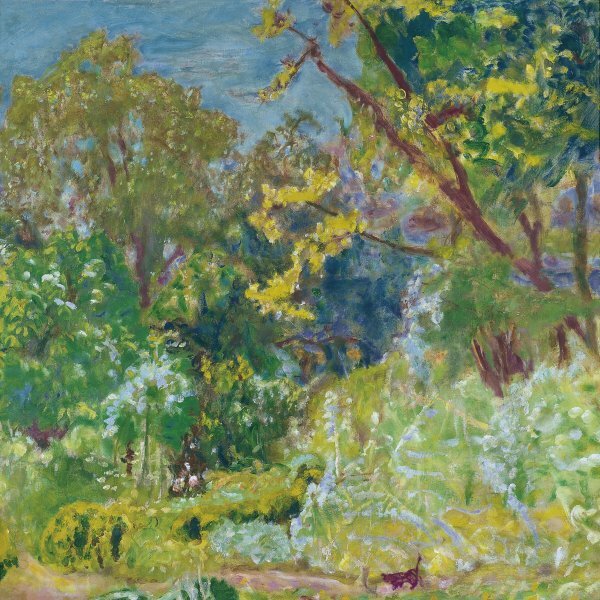 In a picture like this one, Loiseau shows an undeniable talent, but in 1925 art went through crucial changes which followed from the Impressionist revolution of 1874. Unperturbed, Loiseau continued to depict the Parisian landscape and its delicate light with a gentle brush, showing a sense of space, a vivacity in his touch and a feeling for silvery shades which reveals his unfailing loyalty towards his first masters, Monet, Pissarro and Sisley. With a feeling of nostalgia for the struggle of the New Painting which it had supported and encouraged, the Durand-Ruel gallery bought this painting and backed Loiseau's art, as it had done fifty years before with the Impressionist pioneers.